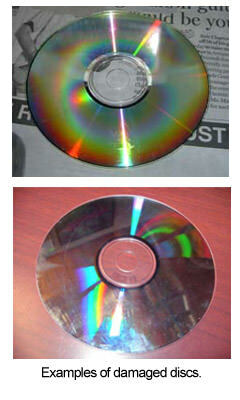 Degradation in optical media refers to the decline of the physical quality of discs over time and can be due to material and environmental factors. Disc format. Each format has a different material composition and therefore deteriorates at a unique rate. Manufacturer. Each company employs their own version of materials, including dyes, plastics, and alloys, which in turn cause discrepancies in quality between brands. The quality of equipment used. Incompatible writing speeds or low-end equipment will weaken a disc faster. Exposure to high temperatures. Heat build up speeds the degradation process by breaking down recording layers of discs that employ organic dye compounds. Excessive humidity. High moisture content can seep into disc cracks or scratches and foster the growth of bacteria or mold that can affect the readability of the disc by a drive’s laser. Consistent contact with UV (ultra violet) rays. Sunlight accelerates the aging of the disc by altering the appearance of recording layers and therefore rendering the disc ineffective. Dust, dirt, and other air pollutants. These foreign particles can accumulate on the media’s surface and in between its cracks or scratches. They not only damage the disc but also cloud reading and recording functions. Improper handling or storage will also contribute to faster deterioration. Conversely, no matter how well discs are treated by the user degradation can only be controlled a certain extent as they have a limited shelf life. Core recording layers of a disc will naturally break down before the outer plastic substrate layers. The outer polycarbonate substrate incurs damage mainly from rough handling and is therefore not considered when measuring overall shelf life. The first signs of deterioration are typically imperceptible because any abnormalities are detected and corrected by the media’s inherent error system. With further decay, a user will be able to pick up jitters and other errors which means the error coding system is losing functionality. The more issues arise, the closer the media is to becoming ineffective for use. The differences between disc formats directly contributes to disc degeneration and therefore each will have a different lifespan. For example, the ROM format for any type of disc (CD, DVD, or Blu-ray) contain a metal alloyed data layer derived from aluminum. Consequently, decay occurs when this metal oxidizes and reduces the layer’s shine. Without this shine, there’s less reflectivity for the laser to use to read reflected data. The R format uses recording layers made with dye that can be prone to accelerated deterioration. Since the dye is chemically altered when a drive laser reads or writes its data, it is extremely photosensitive. Even mild exposure to UV rays can affect longevity. The disc’s reflective side will visibly convey dye dilapidation over time through dark color discrepancies that don’t match the green, gold, blue, or silver appearance of a new disc. RW and RE media formats have two primary factors working against a prolonged shelf life: metallic alloyed layers and a phase changing alloyed layer. The phase changing alloy lacks the stability of discs that employ dye, making them prone to major damage from UV light. Oxidation of the metallic layers additionally counts against its potential for longevity. RW discs are also not purposed for long term or archival use. Their erasable and re-recordable nature is limited to less than 1,000 rewrites, and after they reach this capacity their function declines. Learn even more about how discs wear out and what you can do about it on our blog!